Inspired by a favorite cold-brew coffee, this pecan coffee donut recipe is light, fluffy, and your new favorite breakfast. I knew when we finally broke the seal on the deep fryer it would be the end. For my pants. You see, about a year ago I decided I really wanted to learn more about making donuts, because there aren’t that many places to get great donuts in Austin. My go-to was Red Rabbit Co-op, but they sadly closed. There’s nothing like Doughnut Plant here, which makes me continually sad, especially when Amber brings up their oatmeal donuts. The plan was to make all the flavors flying through my head, so I borrowed Steff’s fryer. And it sat in my garage until we moved, and then it sat in my pantry until we both cried ENOUGH! and made a batch of apple fritters. It’s all downhill from there, folks. Fortunately at the bottom of the hill there are donuts. Or rather in this case, donut holes. The problem I find with yeast donuts, and the reason I turned to baked donuts like baked Samoa donuts and peanut butter and jelly donuts, is that they take forever to make. I’m old enough to remember the “Time to make the donuts” commercials and also old enough to think he was a sucker for getting up so early. Turns out you have to get up that early if you want donuts for breakfast. Nothankyou. Cake donuts have long been my favorite to eat, and they are now my favorite to make, too. These pecan coffee donut holes were inspired by the latest flavor of Chameleon Cold-Brew Coffee, Texas Pecan. They had sent me a bottle to try and before I could even get a chance to make a recipe with it, oops, it was gone. Once I got my hands on another bottle, these donuts were ON. Filled with chopped pecans and covered in a coffee-flavored glaze, these are the lightest, fluffiest donut holes I’ve ever eaten. Store-bought donut holes are dense and always taste a little bit stale, no matter how many preservatives they pump into them. These? Poppable, addictive perfection. My son even told me, “I think you made these TOO good.” Direct quote. Nine-year-olds don’t lie about food, folks. These are best eaten the day of, preferably just after the glaze has set but while the donuts are still warm. If you have leftovers, store them in a paper lunch bag with the top folded over. They’ll get a little bit harder overnight, but will still taste good. (Storing in a plastic bag or container will make the glaze soften and make the donuts kind of mushy.) You can microwave them for 10 seconds to soften them slightly, if you like. And, of course, you don’t have to only cut these into holes! Make them into traditional donuts, if you like, and just have the holes as bonus cook prizes. You can also use the coffee in my mashed potato doughnuts, just in case you want to get even more under the doughnut spell. I used a small deep fryer for this, but you can use a deep pan like a Dutch oven if you like. I prefer the electric fryer because it is easier to keep the temperature steady, and the baskets make it easy to take the donut holes out. 2 1/2 cups all-purpose flour , plus more for dusting. Using a food processor or a blender, process pecan halves until finely chopped. In a large bowl, whisk together pecans, flour, brown sugar, baking powder, cardamom, espresso powder, and salt. In another bowl, whisk together milk, egg, butter, and vanilla. Make a well in the center of the dry ingredients and pour milk mixture in. Stir to incorporate well. Cover and refrigerator for 1 hour. After dough has chilled, heat oil in a fryer or deep pan to 370°F. Dust work surface with flour, and roll out dough to about 1/2-inch thick. Cut out donuts or donut holes using a round cutter, glass, or mouth of a bottle, dipping cutter into flour as needed. Gather scraps, re-roll, and cut until all remaining dough is used. When fryer is hot, carefully drop donuts/donut holes into oil and let cook until deep golden brown, turning as needed. Donut holes will turn on their own, so you might need to hold them in place with a fork to cook the less-browned side. Remove from oil and let drain on a rack set over paper bags, newspaper, or paper towels. Repeat until all donuts/donut holes are cooked. Whisk together the powdered sugar and coffee to make a glaze, adding more coffee as needed to get desired consistency. 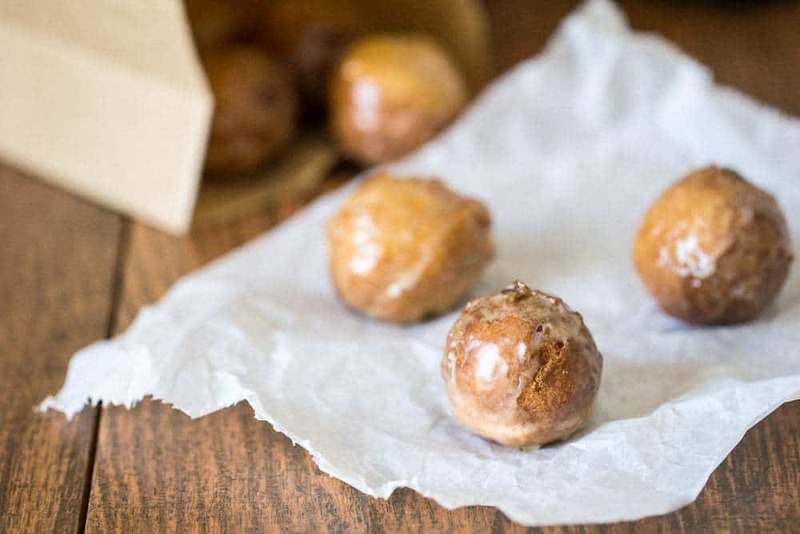 Drop donut holes into glaze one by one and lift out with a fork, tapping or shaking slightly to let excess glaze drip. Return donut hole to rack to let glaze set, and repeat with remaining donut holes. Serve immediately once glaze is set. Leftover donut holes will keep in a paper bag for 1-2 days. I think we need to make these to break in my new kitchen, don’t you? And that damn oatmeal donut.. I’m going to be dreaming about it forever. @Amber I want to re-create it, but it’s been so long I don’t remember what it tastes like. We need a shipment.